In the Philippines, the island barangays, or villages, in the Municipality of Concepcion are geographically isolated, costing residents more money and time to access health care. During periods of inclement weather, accessing the mainland is impossible for island communities. 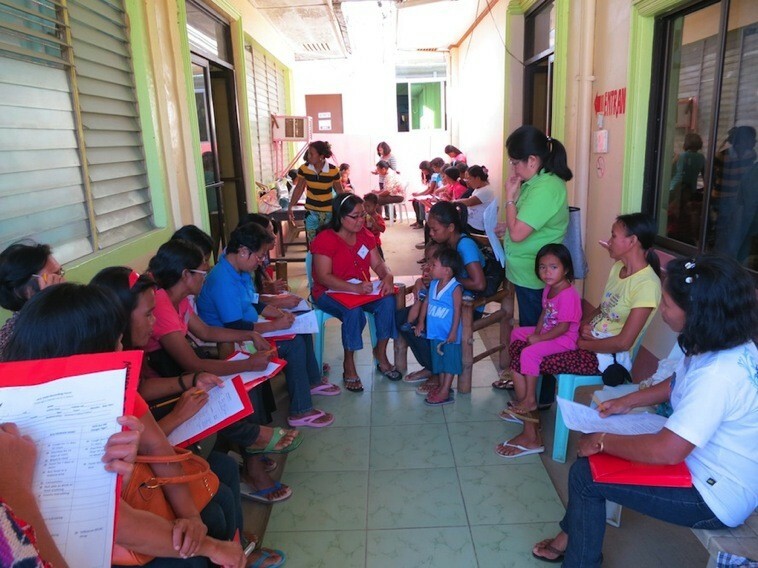 It is therefore of crucial importance that childhood illness danger signs are identified and referred quickly as part of routine community health monitoring by island Barangay Health Workers (BHWs). BHW’s provide an essential safety net in the monitoring of health in their community and act as outreach for the RHU (Rural Health Unit) medical staff and midwives. They play an even more critical role for those vulnerable populations whether affected directly by Typhoon Haiyan (locally known as Yolanda), or through geographical/nautical isolation, or the combination of both. Philippine medical personnel in Concepcion as well as at the regional office have consistently identified community level management and referral of common childhood illnesses as a particular gap in primary healthcare in the Concepcion municipality. In order to improve these skills, Direct Relief funded the training of 50 Barangay Health Workers from Concepcion’s 11 island barangays who participated in the Community Integrated Management of Childhood Illness (CIMCI) training. CIMCI training teaches BHWs how to manage common childhood illnesses such as coughs, colds, fevers, and diarrhea. The ‘Sick Child’ training module, developed in collaboration by the United Nations Children’s Fund (UNICEF), the World Health Organization, and the Philippines Department of Health, highlights 12 key childhood illnesses danger signs. It teaches BHWs to monitor their communities for children presenting with any of these danger signs and refer them for further treatment through a clear CIMCI referrals process. CIMCI training also teaches BHWs to monitor malnutrition in their communities by regularly taking Middle Upper Arm Circumference (MUAC) measurements and referring children demonstrating severe acute malnutrition (SAM) or moderate acute malnutrition (MAM) for further treatment. Testing both prior to and after the training on key CIMCI concepts showed a marked improvement in identifying danger signs and understanding the referrals process to enable sick children to receive prompt medical attention. It was an amazing thing to see–not five months after the typhoon wrecked their communities, people in these Barangay’s in the Concepcion Islands now have access to quality health services, brand new equipment, and an increased knowledge in their profession. Pregnant women previously had to deliver at home or risk traveling by boat to the health unit will now be able to access prenatal care and deliver babies in a new facility with nighttime power, and clean running water. And children who may have had serious illnesses go undetected should now be clearly identified and referred for proper care. When we met Dr. Minguez, the sole doctor in Concepcion, the first thing she said was, “thank you,” but quickly followed up with, “we need to do more.” None of the other health stations, or even major hospitals in the area, have yet been repaired. Direct Relief is proud to have worked with our partner Access Aid International in this program but there is indeed much work left to be done.